Shocking. 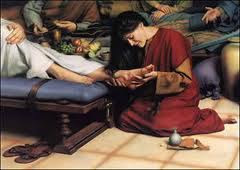 It breaks the rules of respectable behaviour, like the woman Mary of Bethany rubbing perfume on a male rabbi's feet and drying them with her hair, in public. It offends when it looks like a life wasted, like Jesus of Nazareth hung out on a cross to die. Good to the one who can receive it like a baby relaxing in its parents' care, or like a lover in the arms of the beloved. To Judas, the sound of 300 coins, a year's wages, spilling to the ground, rolling away and lost - an extravagant waste. To Jesus, the sound of friends, of tears and laughter and music and companionable silence. The best food and drink, prepared and served by close friends. The taste of friendship, of family, of belonging. Expensive fragrance filling the house, creating unforgettable memories of intimacy, but evoking thoughts of death and burial. "Mary took a pound of costly perfume made of pure nard, annointed Jesus' feet, and wiped them with her hair. The house was filled with the fragrance of the perfume." This post is the 35th in a daily series of Lenten reflections based on a Bible reading from the Common Worship Lectionary of the Church of England. This one is based on John 12: 1-11. I'm pleased you appreciate these Lent reflections - never tried blogging daily before - and never tried restricting myself to only posting on a scripture reading from the daily lectionary - it's been a challenge. Yes we have met. I've been a VA since 2003 in Oxford Diocese. It's a small world, Nancy. I write a very different kind of blog from your, but love discovering the variety there are out there and the sheer amount of accumulated wisdom and insight. Love is seeing a need to help and getting on and doing it. Sometimes we observe but don't see! Thank you Nancy thoughtful start to Holly week. thank you for commenting Margaret - "seeing a need and getting on and doing it" - what a lovely way to think of love.